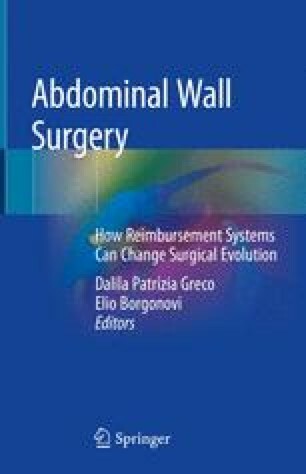 Incisional hernia is a common complication of abdominal wall surgery, including laparotomy, stoma creation, and laparoscopic approach, that causes a negative impact on the patient’s quality of life and body image and may be responsible for potential serious complications. Its repair, moreover, is at high risk of recurrence thus leading to a vicious circle, each subsequent repair being at higher risk of relapse. Direct and indirect costs for these patients are very high with overall financial losses, particularly when the cost of readmissions is added. The magnitude of costs related to incisional hernia strongly suggests the need of effective prevention solutions. Patients’ reported outcome and adequate follow-up have to be better assessed, possibly by large controlled multicenter randomized trials to assess the best cost-effective indications. The European Hernia Society Guidelines Development Group already moved in this direction by publishing, in 2015, evidence-based guidelines on the closure of abdominal wall incisions and, in 2018, those on prevention and treatment of parastomal hernia. Different levels of recommendation are made with regard to the main topics, based on the evaluation of available high-quality studies and meta-analysis. Works are still in progress, as there are still many unsolved questions needing more careful observations and longer, comparable follow-up.